Today we are having a look at two similar 4 berth, rooftop campers, which just like mini-campervans, do not have a bathroom or a full kitchen. They come with two double beds – one inside and one in a tent extension on the roof - and are a great option for a family or group of friends who plan to utilise the facilities at campgrounds or holiday parks. They are both comfortable enough for 4 adults to sleep and ride, or even two friends that want their own bed. The Jucy Champ can accommodate 2 adults and 3 children with seatbelts available for all when on the move. The Jucy Champ campers are a 2002 or newer model Toyota Estima (or similar) fitted out 2017-2018. Jucy is a family-owned business that started out with a small fleet, but now has over 4000 vehicles in Australia, the USA, and New Zealand. Their cars and campervans are painted bright green and purple and they provide free airport pickups for their customers. Jucy has a large group of followers and are popular with young adventurers. With campervans for hire across Australia, the UK, and New Zealand, Spaceships is an orange and white brand that prides itself on offering stress-free rentals for travellers. They provide free airport transfers for 21+ day hires, and they don’t charge you more if you want to pick up a camper in one city and drop if off in another. They also have an awesome on road community, so you can meet others while exploring the country. For both of these rooftop campers, the daily base rate varies due to the time of year and seasonal promotions or discounts. Low season will likely bring you better rates than high season does. For for this article, we did a booking enquiry for the 1st April 2019 to the 15th April 2019 (2 weeks). The prices mentioned for both companies include a standard insurance excess of $3000. Please note: Prices are one time unless otherwise specified Other additional extras you can rent from Spaceships include a table and 2 chair combo for $60, mains plug in for $20, or a 240-volt mains plug for $40. Design plays an important role when looking at Jucy Champ vs Spaceships Beta 4 berth. At first glance, they basically look the same, but there are some minor differences. Remember that these rooftop campers do not have a lot of space, and you definitely cannot stand up inside. However, they are ideal for a group of friends or family that want a place to sleep, some cooking items, and a comfortable vehicle to explore the country with. Rooftop campers are unique in that one bed is inside the vehicle, while the other bed is in a tent on the roof. So how do they compare? Is the rooftop tent easy to use? As mentioned previously, the Jucy Champ has seatbelts for 5 people. There are two bench seats in the back (which fold down to a double bed) plus the driver and passenger seats. Spaceships Beta 4 has one bench seat in the back and is able to take only 4 passengers. This could be a deal breaker if you are traveling with a family. With two bench seats inside and a small table, the Jucy Champ allows for dining inside if the weather turns against you. The Jucy Champs’ beds are spacious: the internal double bed measures 1.9 x 1.3m, and the ‘penthouse’ bed measures 1.98 x 1.2m. Spaceships beds are the same length but are a little wider. The rooftop bed is 1.98 x 1.62m and the internal bed 1.9 x 1.4m. In terms of storage, the Beta has a dedicated space of 1.04 x 0.54 x 0.33m. We don’t have the measurements for the Champs’ luggage space, but we do know that there is space for one large and two small suitcases. You will find that there is room for more though inside, you just might need to have some road trip essentials with you on the bed at night. 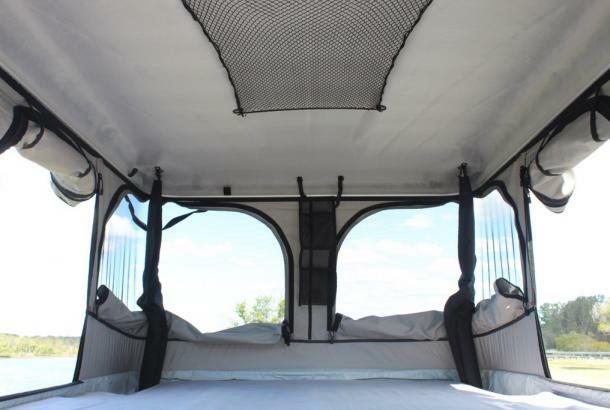 The rooftop tent which is home for the second bed is relatively the same for each vehicle. An attachment on the roof transforms into a tent in less than 30 seconds by winding the opening mechanism, and you can climb up into the tent on a ladder. The tents are wind and waterproof, and have ventilation for warm nights. The mattress stays inside whether the tent is up or down, and you’ll find a handy storage pocket for keys, wallets, or other items. Spaceships Beta 4 Berth comes with a rechargeable flashlight, and also a solar powered ventilation fan. Additional air vents are also included with integrated dust filters, so that you can still have air circulating when the tent is closed. When it comes to cooking facilities, its important to know that the Beta 4 Berth provides 2 cooking burners compared to only 1 in the Champ. If you plan to do a lot of your own cooking while on the road, this may be a deciding factor for you. The Jucy Champ does make up for it in other ways by having a larger 20l fridge (the Beta 4 Berth’s is only 15l), and it comes with a sink. In terms of music to accompany you on your road trip, both vehicles have a CD/radio. Only the Spaceships Beta 4 Berth provides a USB connection, so you can music from an external device. As I mentioned in the Jucy Crib vs Spaceships Beta review, both of these companies are extremely popular and have a large amount of rentals every year. Like with all products and services, only a small number of renters actually bother to leave a review online. Those that do are usually the ones that have had an outstanding experience that they want to share with others, or by people that have unfortunately had things go wrong and are extremely angry or disappointed. In saying this, we can still grasp an idea of the reputation of Jucy vs Spaceships by looking at the reviews left on a few different websites. As a larger company who has been around for longer, Jucy has understandably had more reviews on Hit the Road, with 5* ratings being left by 34% of renters. Spaceships only has 5* reviews from 20%. But then things change when we look at other sites. Spaceships have a high 8.6/10 rating on Trust Pilot, and reading through the comments its obvious that renters have loved dealing with the company and their staff, and really liked how well kept the vehicles were. Jucy has a lower rating of 5.9/10. Comments include problems with the campers, bad customer service and payment problems. Facebook reviews also show a similar pattern. Spaceships only has around 9000 fans, yet 185 have left reviews with a score of 4.4/5. There are lots of comments about how great the customer service was, praise for the comfort of the beds, and how excellent the rental process was. Jucy on the other hand, has 86,000 Facebook fans, yet there are only 8 reviews on their page for a score of 3.2/5. Some of these reviews include mentions of how great the staff were regarding dealing with problems, but then some people have complained about hidden costs and issues with payments. Even though a standard insurance excess is included in the cost of both rentals, you should consider upgrading this. By paying a bit more each day, your excess is reduced, which could actually save you some cash should any accidents happen. Understanding your insurance policy is crucial so that there are no surprises and you are left with a hefty bill for something you were not covered for. Let’s have a look what both Jucy and Spaceships offer in terms of insurance. Excess reduction plans are the same price per day, but Spaceships’ “All inclusive over” offers much more than Jucy’s equivalent package. This means that the tyres, underbody, glass and windscreen are all covered. As for extra deals and incentives, both companies have something to offer. Jucy certainly appeals to those who are passionate about the environment. When renting a campervan, you can pay an extra $1.50 per day which goes towards the planting of new trees in Western Australia. The company also allow their staff to take part in annual volunteering days, so they can help out with community projects. In terms of discounts, there are plenty of offers available to Jucy customers when it comes to activities. And, you can get 10% off site fees when you present your keys at any BIG4 Holiday Park. One rare offering that Spaceships has is that they don’t charge extra fees for one-way rentals. This means you can pick up your campervan in Sydney and drop it off in another city without having to pay more – something that is uncommon with rental companies and can save around $300 in most cases. Spaceships also encourage their renters to connect with other travellers through their online community of ‘Space Travellers’, and you get advice and discounts from ‘Space Mates’ located at meeting points around the country. And as a cherry on top, Spaceships have a large selection of discounts for accommodation and activities through their partners. Spaceships comes out as a clear winner in this Jucy Champ vs Spaceships Beta 4 Berth comparison. Even though the price is almost the same for the rental period used as an example, there are too many benefits of choosing Shapeships’ rooftop camper to ignore. 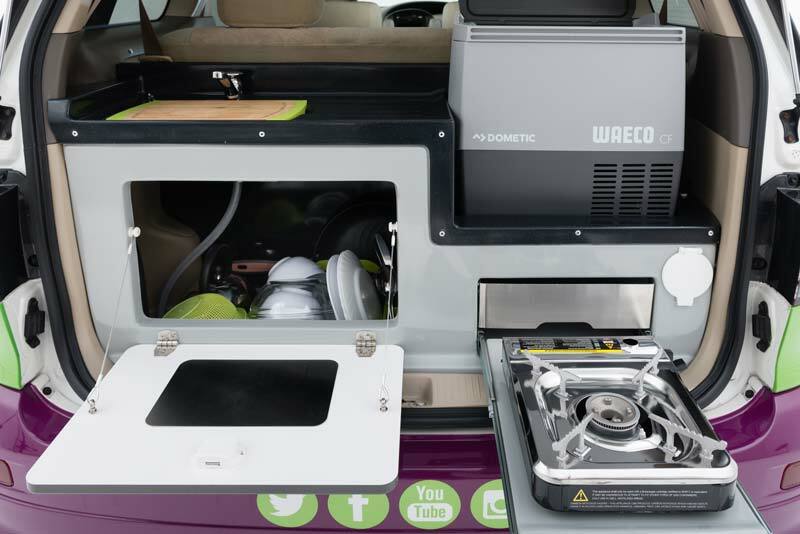 Not only are there useful optional extras that are not offered by Jucy, you get bigger beds, 2 cook tops, and the chance to be connected with other travellers on the road. Jucy clearly have a strong following and years of experience with renting campervans, but the positive feedback for Spaceship online is certainly strong. 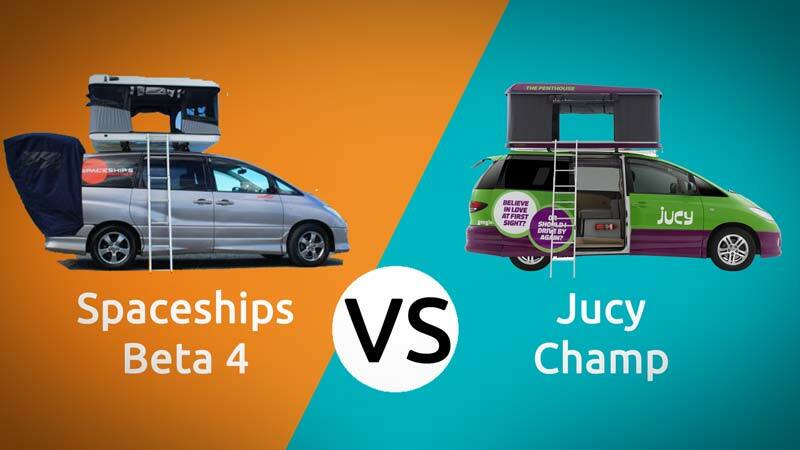 Compare prices of Jucy vs Spaceships campervans using our price comparison engine.